Tswreis RDC CET /TSWDCET Hall tickets, Rank Cards 2019, Counselling Date, List of Documents: Tswreis RDC CET 2019,Tswrdc cet 2019,TSWRDC Entrance test 2019, #TSWDCET Exam on April 16 and Last date to apply is March ...: Girl students can apply through online mode at http://tswreisdc.cgg.gov.in/ on or before March .... 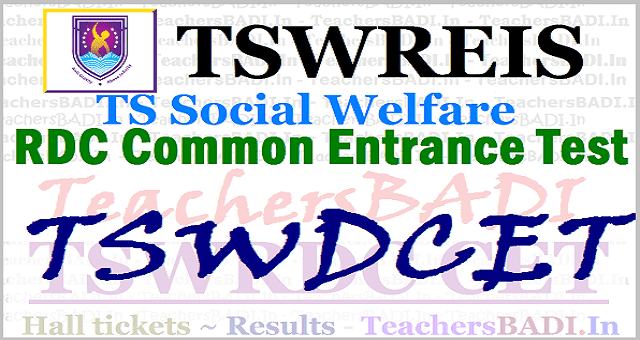 Admission into degree first year courses offered by the Telangana Social Welfare Residential Educational Institutions Society (TSWREIS) Women’s residential degree colleges would be conducted through the Telangana Social Welfare Degree Common Entrance Test (#TSWDCET) on April .... TSW DCET- 2019: "TSWRDC Entrance Test" for degree first year courses Admissions 2019 in TS Social Welfare Residential Degree Colleges. As per a notification on the website of Telangana Social Welfare Residential Educational Institutions Society (TSWREIS): Online applications are invited only from women candidates for TSWDCET-2019 for admission into 1st year B.A/B.Com/B.Sc Degree English Medium Courses in TSW Residential Degree Colleges for Women for the Academic Year 2019-2020. TSWREIS regional coordinator said girl students who want to get admitted into the TS Residential Degree College for Women should apply online before March ..... The government has set up a total of 30 Residential Women’s Degree Colleges in the State, out of which 23 have started functioning from the academic year 2019-2020. The remaining would start from the 2019-2020 academic year. They said 75% seats were reserved for SC women, and the remaining for backward classes. The government has set up specialised colleges to prepare students for civil services examinations at Rajendranagar, Mahendra Hills, Secunderabad, Sangareddy, and Ibrahimpatnam. The candidates who have completed Intermediate or its equivalent annual examination held in 2019/2016/2015 with a minimum of 40% marks are eligible for admission in to 1st year Degree courses. Candidates whose annual income of the parents is more than Rs.2.00 lakhs in Urban areas and Rs.1.50 lakhs in Rural areas are not eligible for admission into 1st Degree Courses. Question Paper (120 Marks) will be objective type. Multiple choice questions and the answers should be marked on the OMR Sheets. The test will be conducted in TSW Residential Schools/Jr.Colleges located in 31 new Districts basing on the option given by the candidates. 1. Candidates can download their Hall Tickets from the website at http://tswreisdc.cgg.gov.in from 06-04-2019 to 15.04.2019 with the reference number allotted to them. The candidates have to obtain rank cards from the Society Website http://tswreis.telangana.gov.in after ....04.2019. Note: Appearing for the Entrance Test does not confer any right for admission. Applicants shall also fulfil other admission criteria stipulated by TSWREI Society, Hyderabad. The Society reserves the right to change the rules of admissions as per the directions of the Government and University from time to time.